Workshop on "Religion: Bridging Gaps and Breaking Paths"
The KFG's Junior Researcher Mohammad Magout will present a paper in a session on "The Praxis of Religion, Theologies and Knowledge Production: Overcoming the dichotomy between inside and outside perspective" at the International KOSMOS Workshop of the Doctoral Program Religion – Knowledge – Discourse at Humboldt-Universität zu Berlin, 2– 4 February 2017: "Religion: Bridging Gaps and Breaking Paths. 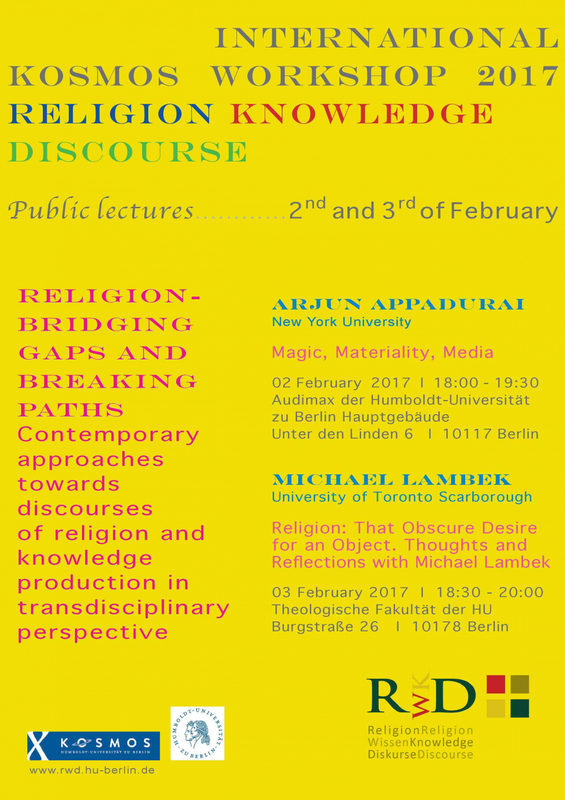 Contemporary approaches towards discourses of religion and knowledge production in transdisciplinary perspective." As a signifier, “religion” figures as one of most vibrant — but no less polyvalent and in many regards polarizing — buzzwords in contemporary academic discourses. Hardly any term attracts more attention and consideration from scholars across the academic spectrum. At the same time, “religion” proves to be, on many levels, a seemingly inexhaustible point of contention. Taking into account both its unquestionable timeliness as well as its sheer complexity and controversiality, “religion” calls for a collective academic effort: the challenge of approaching “religion” demands TRANS-disciplinarity! As such, this conference is designed as an experimental space, a research laboratory for contemporary approaches towards “religion", discourses of religion and knowledge production. In the spirit of our intentionally ambiguous slogan, “bridging gaps and breaking paths”, we seek to bring together voices from various academic backgrounds for a constructive, mutually challenging and inspiring dialogue. We cordially invite senior and junior researchers with advanced research projects approaching “religion” in innovative ways, who are also open to think and interact beyond their academic disciplines, to join us in our endeavor. This conference is a collaboration of the transdisciplinary research scheme Religion – Knowledge – Discourse (RKD) and will be held at Humboldt University of Berlin. The objective of the RKD research cluster is to encourage young scholars to critically investigate and reflect on discursive categorizations and notions of religion and knowledge by means of diverse empirical and theoretical inquiries. Since the establishment of the RKD in 2014, junior and senior researchers have brought together insights from various disciplinary backgrounds, ranging from Sociology, Economics, and Anthropology to the study of Religions, Philosophy and Theology. The RKD research group, by means of this conference, seeks to gather and share these insights with a broader audience, inviting others to join the critical exchange on the conjunction of Religion, Knowledge and Discourse.